Kids are always finding new and inventive—but not necessarily safe—ways to play on or around playground equipment. And while they may scrape an elbow or bruise a shin, it’s important to take steps to eliminate the risk of more serious mishaps. We make playground safety a top priority at Landscape Structures, and we’ll help you keep kids safe with our age-appropriate products, safety surfacing and shade systems. According to the National Program for Playground Safety (NPPS), playground climbers cause the most injuries to children. Often, these injuries occur because the child was using equipment designed for a different age group. That’s why we have age-appropriate playground equipment available for park planners. Whether you want to provide play opportunities for infants and toddlers, preschoolers or kids ages 5 to 12, we have the right equipment to fit your needs. Additionally, the NPPS says that falls to the surface contributed to nearly 80 percent of all injuries. We can help with that, too. Our PebbleFlex® playground safety surfacing provides enhanced safety and durability to create play areas where the fun never has to stop. And don’t forget to protect kids from the harmful UV rays of the sun! CoolToppers® shade systems block up to 90 percent of UV rays and keep playground temperatures up to 30 degrees cooler. Even better, they add a unique aesthetic to your playground design. We offer a playground safety program (through Landscape Structures) to help teach elementary school students the importance of safe play. 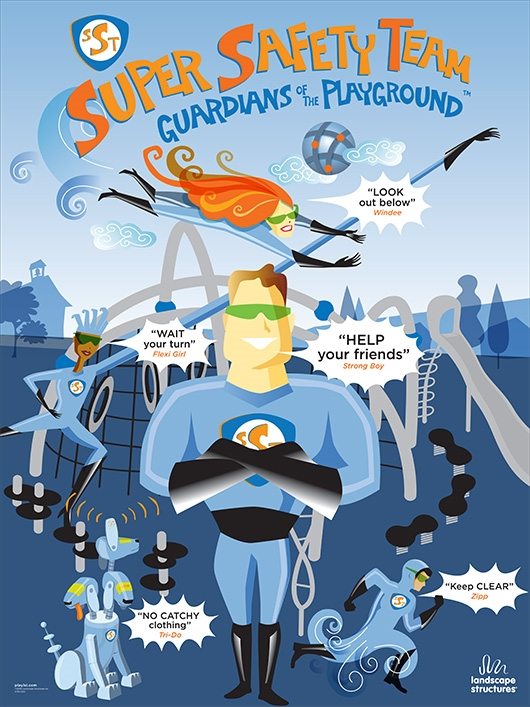 The program, featuring the Super Safety Team, Guardians of the Playground, contains practical tools for schools.